In the 1930s, the “new” nation of Ireland, finally freed from the yoke of Great Britain, established a Folklore Commission to preserve the stories and oral traditions of the people of Ireland. 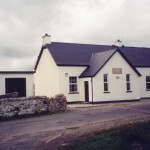 The Irish Folklore Commission collected 2 million manuscript pages and many sound recordings, photographs, and videos. The main Manuscript Collection holds 2400 bound volumes of material collected since 1932. Two-thirds are written in the Irish language. It is the goal of Duchas.ie to digitize the National Folklore Collection. It recently started digitizing the Schools Collection which contains 740,000 pages of material gathered from 5000 primary schools of the Irish Free State between 1937 and 1939. This material was written on exercise books by about 50,000 school children. The children wrote stories from the memories of their parents, grandparents, and neighbors. It was said long ago that there was the full of an asses skin of gold hidden in a little lough. This lough is all covered with moss and rushes, and the people call it “the blind lough.” Some men looked for this gold, but they never found it. It is said that there are seven men to be lost looking for this gold. Under the big rock on Mick Gallen’s street there is supposed to be a huge amount of gold. This gold is in a crock. John Mc Glynn, Mick’s grandfather, who lived in Glenfinn told about the gold. He told about one night as he was lying in his bed before going to sleep. There came in a red haired woman, who told him that near Mourne water, under a rock on a street, was a pot of gold. She also told him that three men could turn over the rock, but one of them would be killed. Three of Mick’s brothers were going to turn it over, but their mother would not consent. This rock is in the townland of Meenreagh. There is another pot of gold in the river Derg, below the town of Castlederg, in a place called the Castle Hole. This pot is guarded by a monster eel, with two rows of eyes from its head to its tail. A lot of divers have gone down and seen this monster, but when they saw it, it twisted around the pot so they had to return without the gold. For when this monster saw them it would try to get hold of them. If there is a storm coming, the sheep all go to the valley. When the weather is going to mend, they go to the hills. If the hills seem near to us, it is a sign of rain. A rainbow on a Saturday is a sign of a whole week’s rain. When there is a storm coming, the robins all sing. When the crows fly very low, it is the sign of rain. When the clouds are running across the sky, it is the sign of high wind. When there is a smoke in a house, it is a sign of rain. A blue blaze on the fire is a sign of a storm. If there is a near hand ring around the moon, it is the sign of a far off storm; if there is a far off ring around the moon it is the sign of a near hand storm. If the wild geese fly near to a house it is the sign of a great storm. When the cat is washing her face, if she puts her foot over her ear, it is a sign of a big flood. When the stars shoot in the sky, it is the sign of frost. When salt gets wet, it is a sign of rain. The soot falling down the chimney is a sign of a storm. If the cat sits with her back to the fire, it is a sign of rain. A donkey roaring is a sign of rain. A cow shaking herself in the byre is a sign of rain. A cat scraping with her claws is a sign of rain. A motor glittering late in the evening is a sign of frost. A rainbow in the morning is a sign of a bad day. A rainbow at night is a sign of the next being good. When the wind comes from the south, it is a sign of rain. When the wind comes from the north, it is a sign of good weather. When the fire is very hot, it is a sign of frost. In the year 1812, a great snow storm took place. The storm began at four o’clock on a Monday evening. On Tuesday morning the snow was almost five feet deep. The storm lasted for a week and at the end of that time no one could go out-side because the houses were almost covered with the snow. At last the people had to dig passages to the byres in order to get hay and water for the cows, horses and many other animals. The Big Wind of 1839 lasted about an hour. It tossed all the turf stacks; it also tossed bushes. A woman named Bridget Gallen lived in a barn. The candles were lighted over her, and when she was dying the wind lifted the roof off the house where she was lying, and let it fall down again without doing the house any harm. It is said that there were people living in Donegal whose names were Fodoals. They saw the devil and he gave them money to come with him. It was the death of one of them which caused the big wind. One Sunday about 72 years ago there was a great thunder-storm. It happened in the year 1866. There was terrible wind, rain, thunder and lightning. A big thunder bolt fell in Hugh Sweenie’s bog. There was a terrible flood and it went around Brian Dougan’s. Two men whose names were Thomas Gallen, and Patrick Gallen were in Brian’s house and they could not get home till the flood ceased. 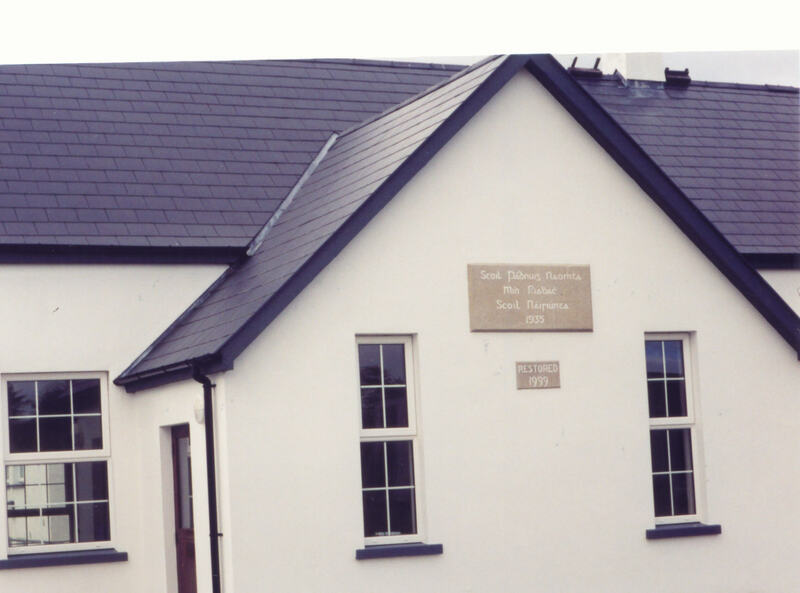 OLD SCHOOLS – Written by Patrick J. Gallen of Meenreagh from Miss Ellen Gallen of Meenagoland. There was a school over behind Corgary planting. The school was an old thatched house and there was no chimney on it. The master used to shake hay on the floor. The children used sods for seats. The master’s name was James Monley. The children used slates instead of books; they wrote their lesson on the slates. Beside our house are the remains of an old hedge-school. It is used for a hen-house by my mother. 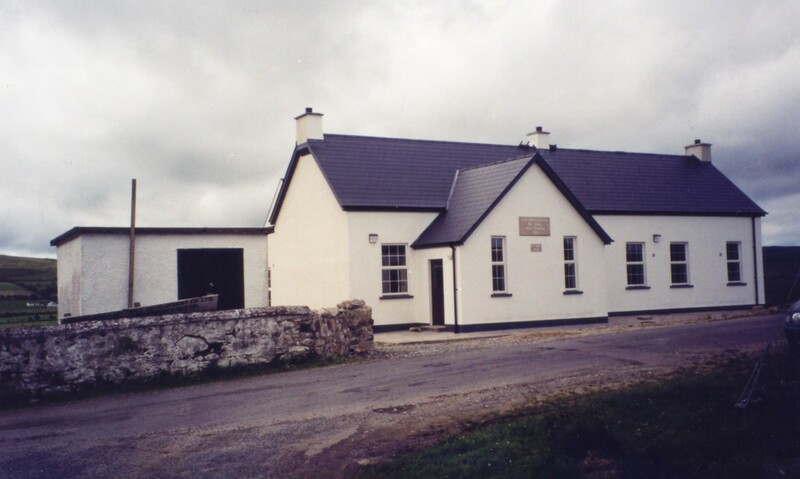 The school was an old house. The master who taught in it came from Co. Mayo. The master was named John Heggerty. He liked to teach Irish. The children wrote with quill pens, made from the feathers of geese or crows. The master stopped with the people who had children attending the school. He stayed in each house in their turn. He stayed in this district for about two years. In the year 1841 all the schools were taught in farmer’s houses. The teacher stayed a week about in the houses, and every child gave him a shilling a week. The children were taught in the following way; some one of them would bring an old book which belonged to his parents when they were at school, and he would bring it to the master. The rest of the children wrote out a lesson out of this book every week on a slate. When all the children got the lesson well off they could say the lesson without looking at the slate. When there was no master the best of the scholars used to teach the rest of them. 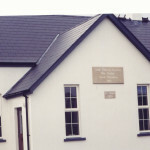 Irish was not taught in these schools. If you get a white stone in the bog and carry it in your pocket it is supposed to cure the toothache. When anyone has the whooping-cough he can be cured by going out between the donkey’s two legs three times. A person whose father and mother are of the same name can rub for a strain. If any man has the shaking ague he can be cured by getting weeds growing in the hay and boiling them and drinking them. A cure for a cough is to boil whins and drink the water. If you find a little hole of water in a rock and take some of it, it would cure toothache, burns and many other things. A boy who never saw his father can cure the ferey that a horse takes in his leg. The cure for sore eyes is to bathe the eyes with black tea. If a baby gets a strain when it is very young and gets it rubbed he can rub for a strain afterwards themselves. When anyone takes the toothache the first time, if he rubs his jaw on the donkey he will never take it again. A person who has kidney disease can be cured by getting a weed called the “golden twine” and drinking it.